By definition a mission statement is a statement of the purpose of a company, organization or person,its reason for existing . It should be noted that I have seen plenty of beautiful nonsense when it comes to mission statement. At minimum, your mission statement should define who your primary customers are, identify the products and services you produce, and describe the geographical location in which you operate if need be. It should describe your key market and your contribution. It should explain why your product or service is unique, setting out reasons why a prospective client would, or should choose you. No wonder most businesses find writing a mission statement hard. If you’re stuck, you could try using any handy mission statement generator to help you come up with a mission statement like this one. You want a case study? You have it. an example of a poor statement. This, of course, is the truth, but it sure as hell isn’t motivating. Your mission statement shouldn’t live in a dusty A4 file, or be buried on a long forgotten, never updated page on your website. And it shouldn’t just be something you say. It should be something you live every day, on purpose. What are you doing right now, today? Why does your business exist? Why does it matter? Are you actually on a mission, or are you just saying that you are? 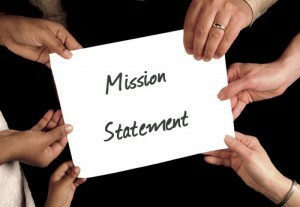 Don’t fail to communicate your mission statement to your employees or volunteers effectively. Posted on May 31, 2014, in Business. Bookmark the permalink. Leave a comment.